MegaMari - Marisa no Yabou (MegaMari - 魔理沙の野望, lit. 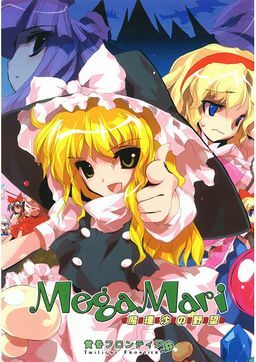 "Marisa's Ambition") is a Touhou Project clone of Mega Man 2 by Twilight Frontier, the makers of Immaterial and Missing Power and Hopeless Masquerade, starring Marisa Kirisame and Alice Margatroid. Tired of Marisa (and occasionally Alice) constantly 'borrowing' books from her library, Patchouli Knowledge has hatched a plan to stop the incessant theft. Stashing her book collection deep inside a mechanized fortress filled with traps, she enlists the help of several other Touhou characters, all of whom have their own bones to pick with Marisa for one reason or another. With the help of Alice, Marisa sets out to defeat the other girls and gain new powers from them before making a climactic raid on Patchouli's castle to bring home another big haul of books. This page was last edited on 12 November 2017, at 02:06.